Nature’s Mill family of yeast, probiotic and enzyme products employs nature’s own tools to improve health and performance. The Nature’s Mill product line offers several ways to boost efficiency and productivity. Each of these products is specifically designed to improve the digestion of livestock feeds or pet foods. Better digestion means more performance with less feed. You and your animals both benefit from the Nature’s Mill advantage. 100% cultured mash containing yeast, original fermentation media and metabolites. Full grain media. Corn-based mash, not fiber by-products. Metabolites preserved. Gently dried while suspended in a low-temperature air stream. Insect control. Purified to guard against insect infestations. Packaged for freshness. Four-ply, poly-lined bag, others use 2-ply bag with no liner. Better economics. Our one-pallet price beats their truckload price. 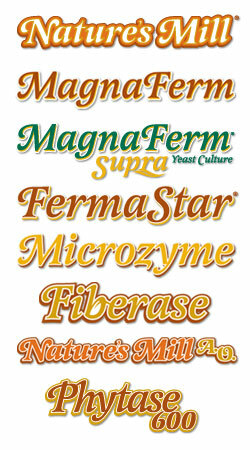 MagnaFerm Supra Yeast Culture is a high-quality source of fermentation media and live, active Saccharomyces Cerevisiae yeast cells that are matured in a multi-stage fermentation. The yeast cells are delicately dried and preserved in the original rich fermentation media to retain the fermentative and enzymatic activity of the yeast. Live, active yeast. Over 1 Trillion CFU per pound. Five strains of naturally-occuring probiotics. Totals 100 Billion CFU/lb. Five types of digestive enzymes. Boosts feed digestion and milk production efficiency. Lowest use-rate at 10 grams (.35 ounce) per day in dairy cattle. Live, active yeast. Over 192 Billion CFU per pound. Five strains of naturally-occuring probiotics. Totals 11.5 Billion CFU/lb. Eight types of digestive enzymes. Lower use-rate at 1 ounce per day in dairy cattle. Supplemental source of natural digestive enzyme to improve the availability of organic phosphorus in animal diets. Phytase 600 is manufactured to improve phosphorus availability from organic animal food ingredients. Adding 0.05% of Phytase 600 in the finished diet formula increases the digestible phosphorus in typical rations for monogastric animals (poultry, swine, equine, dog and cat food) by an average of 0.138%.